Haaa..what a perfect sky! And, quite frankly, it’s a perfect #PeterParkers pic! Note: What is a #PeterParkers pic? See here for definition. So is this a Perfect Parker Pic or a #PeterParkers Pic? Wait! I got it! That’s an Infinity brand car. 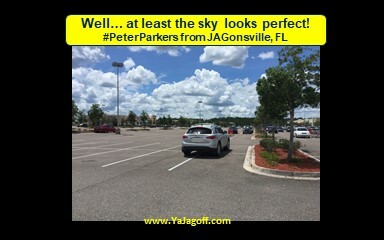 The driver thinks that all parking spaces go on for infinity… no lines, no barriers, no end! Just park wherever the @#$& ya want! One note.. if that’s a new car, and ya don’t know how to park it, for garsh sakes, go refine your not-so-fine motor skills. And, Christmas shopping season is only a few months away. You’d better get that parking thing under control before before that lot is packed with anxious-hyper-vigilant-on-a-mission-this-is-the-happy-season-but-I-am-miserable-as-hell season! And one more thing, if you’re a guy driver, I sure hope your aim at the toilet, when you pee, is better than your aim at that parking spot… YaJagoff! Thanks to Rick Eberhart, Jacksonville, FL, for being today’s Honorary Jagoff Catcher!